Medal holder, Display, Hobby,Hobbies, winning, Sports, Football, Rugby, Gymnastics, cheer, Dance, Running, Trophy, Personalised, Name. These beautiful handmade Medal Holders are made to order to display in any hanging medals awarded for sports & hobbies. Great to display in any bedroom or living room or entry way for display purposes only not to be used as a toy. 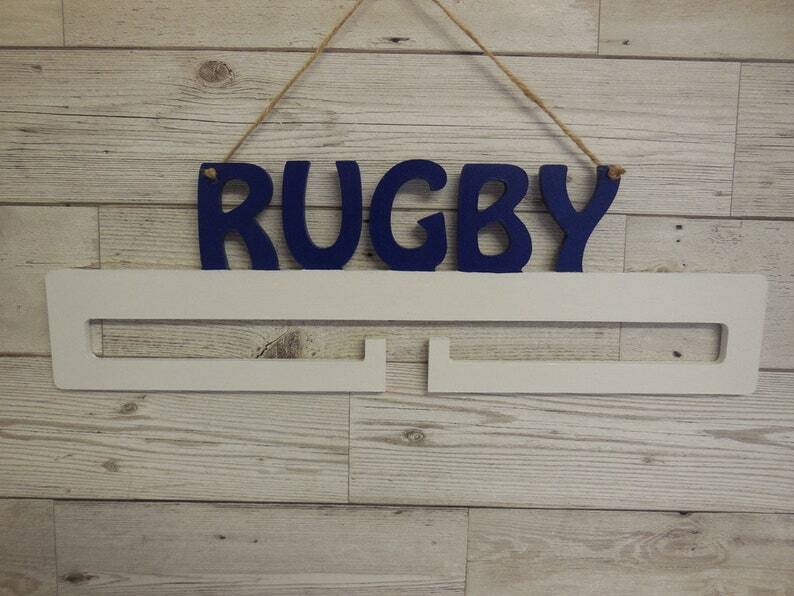 You can request them painted in any colour of your choice including matching sports team colours / uniforms. Cancelations can only be made 24 hours after placing your order due to the wood being custom cut. All my items are handmade to order & the options are endless when it comes to decorating MDF plaques or products it would be impossible to list everything you could have please get in touch with your ideas & I can use all of your suggestions to come up with a pretty gift for you to give to someone you love. Please check out my other listings for all the pretty things I can make.